Red → Green → Green (flashing) → Red. Of course, red means, “Do not cross.” Green means, “Cross.” But, what does “Green (flashing)” signify? 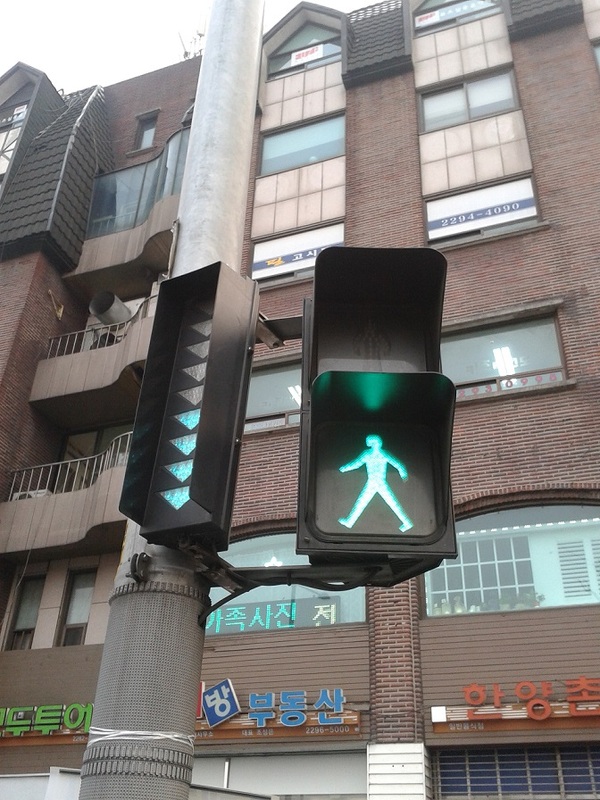 If a pedestrian starts to cross when the green light is flashing but is unable to fully cross in time (i.e., before the light turns red), that person will not protected as a “pedestrian” (보행자) under Korean law. Please read Article 3(2)6 of the Act on Special Cases Concerning the Settlement of Traffic Accidents (교통사고처리특례법) or Article 27.1 of the Road Traffic Act (도로교통법). If you’d like to learn more, please refer to the Korean Supreme Court Decision of October 9, 2001, 2001Do2939. 2) If the pedestrian suffered “aggravated bodily injury” (e.g., permanent disabilities). Some pedestrian crossing signals start to flash as soon as they turn green. Presumably, it means: “If you weren’t (originally) waiting, do not cross. All new comers stop.” Today, many pedestrian crossing signals have accompanying “bars” or “numbers” (photos below). Regardless, the “green person” still flashes after a while. So, an insured motorist involved in a traffic accident not falling under any of the aforementioned scenarios will not face criminal liability (in Korea). Such an act would, in principle, constitute the crime of “Bodily Injury/Death by Occupational Negligence” (업무상 과실치사상) under the Criminal Act (형법). But here, the Act on Special Cases Concerning the Settlement of Traffic Accidents (referred to as “the Act” below) takes precedence. In Korea, when a special law comes into force, it takes precedence over all other general laws. The Criminal Act, a general law by design, functions as a “catch-all” law, so to speak. With the exception of the aforementioned scenarios (11+2), the motorist cannot be indicted (i.e., face criminal liability). In a way, the Act aims to “protect” the motorist, at least, in case of relatively “minor” traffic accidents, provided he/she is insured. A settlement, in itself, will not prevent the perpetrating motorist from being indicted. What it can/will do, however, is allow the perpetrating motorist to receive less severe criminal punishment (i.e., avoid actual prison time). If a settlement is reached and submitted, the court will take it into account, and the motorist will most likely end up with probation (집행유예) or even a criminal fine (벌금). This is critical. Not “physically” ending up in jail. 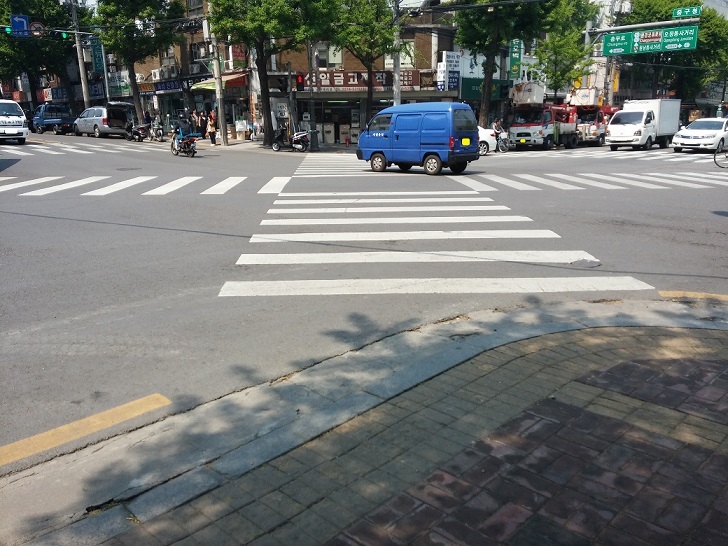 A few days ago, a district court in Ulsan rendered a (tort case) decision which found a badly injured jaywalker 50% responsible. 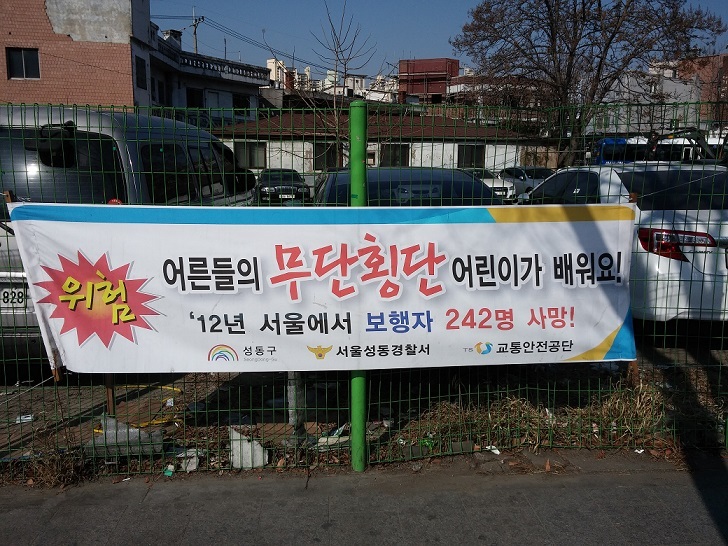 The court did find for the plaintiff (jaywalker), but limited the damages to 17 million won. The plaintiff was hit by a motor vehicle while crossing against a red light (i.e., contributory negligence). On a personal note, I don’t like to jaywalk. Not only could I get a ticket of up to KRW 30,000, I could also end up badly hurt. For me, it seemed to be habit-forming, and very few things were actually that urgent. All it really takes is one mishap. I also recently decided to stop walking with earphones. I’d heard numerous news reports of how dangerous it could be. So one day, I threw away my old iPod because I would keep using it while walking. That, too, was habit-forming. Below is a police banner urging pedestrians not to jaywalk. In October of last year, a Korean district court held that back-seat passengers (of taxis) who fail to buckle up are 5% responsible (in case of injury suffered due to traffic accident). 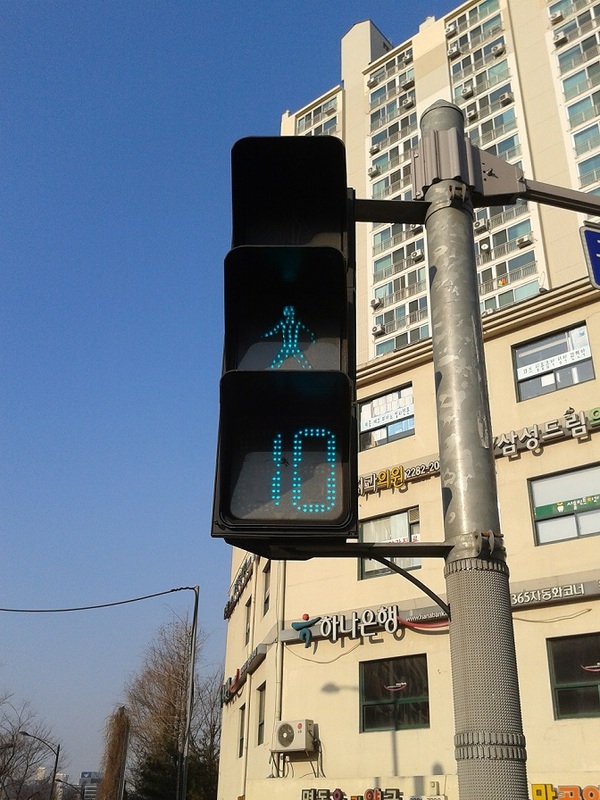 In Korea, bicycles must be dragged/walked (i.e., not ridden) when using a crosswalk.